Editor's Note: There is a photo associated with this Press Release. A grant from the Ontario Ministry of Aboriginal Affairs is enabling DAREarts to return to the remote community Attawapiskat First Nation to continue its relationship with the students and teachers of J.R. Nagokee Elementary School. DAREarts, responding to Attawapiskat's state of emergency, sent artist/educator Cathy Elliott to collaborate with grades 5,6,7&8 on six songs which were recorded, performed in Attawapiskat, and rendered into "Karaoke" videos posted on You Tube. Exactly two years later, March 18 - 26, 2014, the grade 8 students will be turning one of those songs into a music video. "Muskego Land" will be premiered in Attawapiskat, coinciding with the official opening of the new school. (a rough cut will be shown at the school at the end of the ten day workshop.) The music video will be conceptualized by the students, involve community members, and will be shot on location in town and out on the land. A documentary by the students will chronicle the process. This project supports the grade 8 curriculum which integrates Cree language, performance, technology, and film/video vocabulary/literacy. The students' voices will be recorded and added to the song, for the new track on the video. Accompanying Cathy will be film maker Peter Elliott, who co-created the DAREarts Webequie documentary "Fill My Hollow Bones" and will be instructing the technical application of video shooting and editing. This project follows the successes of work in October in Marten Falls FN as well as in Sipikne'katik FN, N.S. In the video called "Melkikno'ti" (Courage) the song is passed like a torch from one group of children to another, so that an idea is built upon and developed, increasing the community building benefits of communicating and creating through the arts. The poem by students in Marten Falls, called "The Land Speaks", was visually interpreted by students who followed students from the year before. This continuity and peer teaching helps to build confidence and pride in the children, who are celebrated during a Feast and showing that caps each workshop. 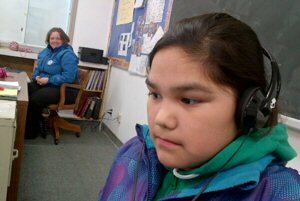 Chief Theresa Spence was on hand at the Attawapiskat showcase in 2012, to witness the songs that the kids wrote. "We need programs like this. The kids need something to do, to keep themselves occupied in a positive way." DAREarts Founder & President, Marilyn Field, said, "The arts are the most powerful tools to build our children's future." An online diary about this project will be appearing in DAREarts' blog darearts.wordpress.com called "DAREarts, Attawapiskat Spring ll." DAREarts is a Canadian not-for-profit organization, which stands for "Discipline, Action, Respect, Responsibility and Excellence in Education". DAREarts' 5-year program works with 9-14 year olds from schools in high-priority neighbourhoods, empowering them to become leaders. Visit www.darearts.com for more information about DAREarts. Visit http://www.darearts.wordpress.com for up-to-date sharing of their experiences.